Pro tips for picking out tiles, creating a design you love and compensating for your learning curve. To update a bathroom, you could swap out the cabinet pulls and switch the faucet. But if you’re ready for a bigger change, almost nothing is more effective than new tile. Replacing tiles that are damaged, stained, outdated or just not to your liking is an opportunity not only to refresh a bathroom but also to give it a whole new style. And with all of the materials, shapes and colors available, you have the chance to create something extraordinary. But that’s also the problem: With all those choices, how do you know you’ve made the best one? Ceramic is the most common material for bathroom tiles, but there are several other popular options, including natural stone, glass and cement. Each offers a decidedly different look and feel. Susana Simonpietri, a partner in the Brooklyn interior design firm Chango & Co., said she prefers cement tiles when she wants a graphic punch, because they often come in vibrant colors and patterns. For the bathrooms in a recent project on the North Fork of Long Island, she chose two types of cement tile: rectangular tiles with a blue-and-white pattern of elongated triangles from Popham Design for one bathroom floor, and hexagonal white tiles with blue outlines from Clé for another. Of course, the dramatic effect tiles like these create, Simonpietri noted, doesn’t appeal to everyone. “A lot of people want that classic white bathroom,” she said. For those clients, she often chooses large rectangular tiles made of white marble, as she did in a beach house she recently designed in Amagansett, New York. If you prefer a Zen-like environment that’s a little more colorful, she suggested using ceramic tiles in subdued hues or glass tiles in blues and greens. Whatever you choose, it will set the design direction for the room — especially if the tile has a graphic pattern or bold colors. “When you’re driven by a specific color or pattern, it really informs all the other decisions,” said Keren Richter, who runs the Brooklyn interior design firm White Arrow with her husband, Thomas Richter. For the walls of a bathroom they renovated in a 19th-century loft in Brooklyn, they collected an assortment of vintage blue-and-white Portuguese azulejos. “I found them on eBay over the course of a year,” she said. To allow the Portuguese tiles to be the star of the room, they chose simple white hexagonal tiles for the floor, expanses of white plaster for the remainder of the walls, and a color-coordinated blue for the doors. For another bathroom in the same home, they did the reverse, laying vibrant blue Moroccan zellige tiles on the floor, with white tiles on the walls. Using patterned tile is just one way to add drama to a bathroom. The shapes of the tiles can also add visual interest, especially when you use different forms on different surfaces. For instance, you “might do one wall of a walk-in shower in a particular shape, like hexagons,” said Jamie Chappell, creative director of the San Francisco company Fireclay Tile. Then you could use a rectangular subway tile on the other walls. She pointed to customers like Megan Gilger, of the blog Fresh Exchange, who installed hexagonal tiles with an earthy-blue glaze on a bathroom floor and rectangular tiles with a silvery-green glaze on the walls. Anna Liesemeyer, of In Honor of Design, used hand-painted square tiles on the floor of her bathroom and star- and cross-shaped tiles on the walls. Studio DB, a New York design firm, uses this technique as well. For one client, the designers installed hexagonal cement tiles with a red-and-white stripe from Original Mission Tile in a swath extending across the floor and up the back wall of the shower. “Then we did subtle subway-style tiles on the other walls to keep it from getting too crazy,” said Britt Zunino, a principal of the firm. If all that feels like a little too much drama, there is a subtler way to introduce visual interest to a bathroom: Instead of choosing a vividly patterned tile, focus on the installation pattern. Simple square and rectangular tiles don’t have to be installed in a grid. In fact, while a grid, or straight stack, looks modern and clean, it can also feel cold or institutional. A common option is an alternating, or running bond, pattern that staggers tiles like bricks in a wall. Some designers prefer to mix tiles with the same finish and varying proportions, for a less symmetrical installation. With all those colors and shapes to play with, it’s easy to forget about the humble material that holds it all together: grout. But the color of the grout and the width of the grout lines have a big effect on how your bathroom is going to look. Matching the grout as closely as possible to the tile color and using thin lines will make the grout almost disappear. A contrasting color and thicker lines will make individual tiles visually pop and can be used to give budget tiles a stylish lift. For the bathroom in their office, the designers at White Arrow installed inexpensive square white tiles on the walls in a straight stack, then finished them with thick black grout lines to create a bold grid. “We were trying to maximize the visual impact with a very minimal budget,” Keren Richter said. 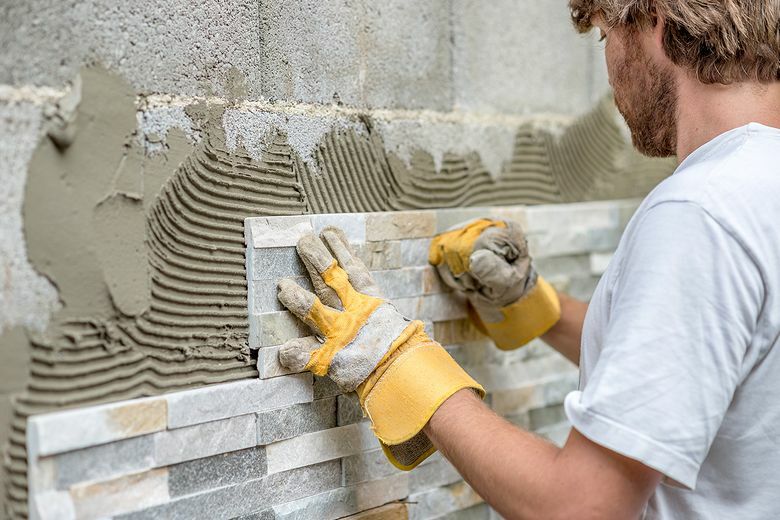 Chip Brian, the chief executive of New York general contractor Best & Co., said his installers sometimes use grout lines as thin as 1/32nd of an inch. But such installations usually require precisely cut, or rectified, tiles that are perfectly uniform in shape. For tiles with slight irregularities, thicker grout lines are a better choice. 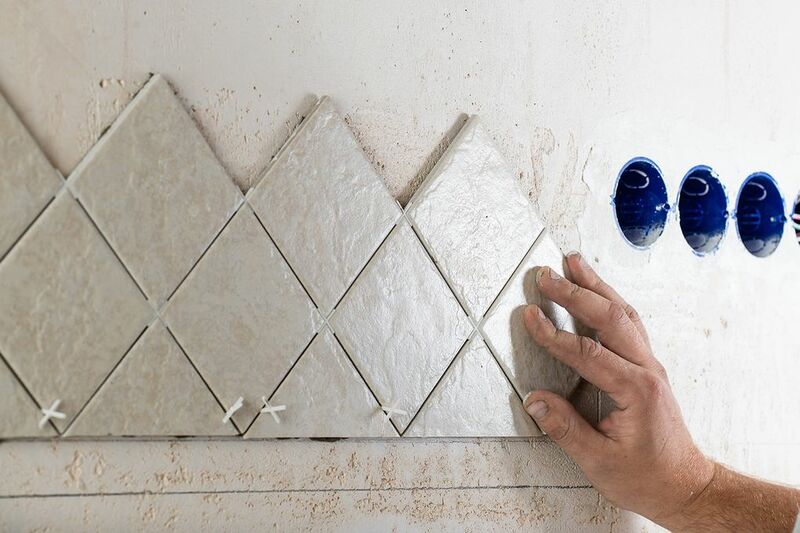 Because most tiles are unfinished on the sides, installations that don’t run wall-to-wall and floor-to-ceiling usually require some sort of trim at the edges for a clean, finished look. Some ceramic tile and stone manufacturers make special trim pieces, or tiles with bullnose edges, for this purpose. Other options include thin metal strips, available in a variety of finishes from companies like Schluter Systems, or even simple wood trim that can be painted to match the wall. And if you don’t enjoy standing on a frigid bathroom floor in the winter, that’s a relatively easy problem to fix when you’re retiling. An electric radiant-heating mat, made by companies like nVent Nuheat or Warmly Yours, can be rolled out on the floor before the new tiles are laid to eliminate the chill. For homeowners who opt to install the tile themselves, Brian had some advice. Different batches of tile, he explained, often have slight color variations. “We carefully unpack all the boxes, mix the tiles and then lay out the tiles on the floor to mimic the walls,” Brian said, to ensure the color will look consistent across the room. He had the same advice about grout: Mix the contents of each container to blend pigment that may have settled to the bottom, and then mix multiple containers together to create a consistent color. Finally, if you have never tiled before, remember that your first attempt almost certainly won’t be your best.